If you have an online store, you know building product information is one of the important aspects. You might have already added a number of products on your site. However, that is not enough. You also have to make sure that on each of your product pages, there is ample information for your customers to make a decision. Visitors on your individual product pages will be definitely interested in the product, and it offers great scope for conversion. 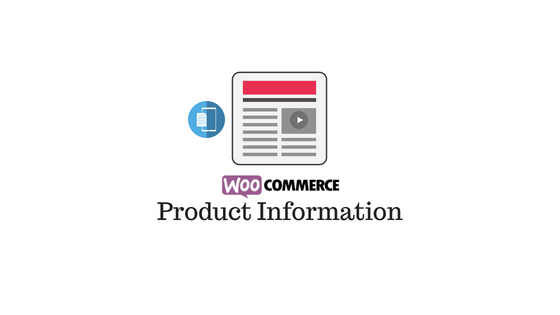 It is important that you make use of this opportunity by professionally building product information on WooCommerce. Here is a list of strategies that you can adopt on your WooCommerce product pages for better conversions. How customers find your products? Listing products on your WooCommerce store is only the first step in the process. One of the determining factors that makes your store a success, however, is the ease with which customers are finding them. How can you make your products easy to find? By defining their attributes using words that your target audience is using. Sometimes your products may have quite a few technical features that you are quite proud of. However, if your product pages have only those highly technical words, it might become quite hard for them to show up on search engine results. The reason for this is because customers often don’t search with technical terms, they use natural language based on how they use a product. You need to be on top of things like this if you intend to make your products popular. Let’s look at some of these aspects and helpful tools in more detail. Twiggle is a great tool powered by artificial intelligence to enable your customers find your products more readily. It integrates with your product pages and determines the relevance of customer searches. Twiggle makes better sense of search queries and intelligently determines when customers are looking for your products. This would mean your products will be displayed in search results in a more targeted manner. Understanding the context and intent of customer searches will make the process of online shopping much smoother. You will find a lot more AI-enabled eCommerce tools here. How you display the price information of your products? The price of your product is one of the most important factors prospective customers are interested in. It is very important that you display price information in a transparent fashion on your site. A lot of purchase decisions might be made simply based on a comparison of the displayed price with your competitors. There are multiple strategies you can adopt depending on the nature of your business. This is a valid strategy if you are selling products in an international market, and a lot of your customers use another currency. On a general note, shoppers evaluate the price of a product in their home currency. The basic understanding of whether the product is affordable, it offers value for money, etc., will be made in the customer’s home currency. So offering price information in that currency will offer you brownie points. This widget helps you convert your product prices dynamically to suit the demands of varied markets. It manages to display the price in a different currency, by dynamically grabbing the exchange rate using the Open Source Exchange Rates API. When you are using this widget, the checkout will be still through the base currency of your store. The concept of base currency is explained here. However, the widget score the converted amount as well, to let you have an idea on what the customer saw. You will find more currency converter tools in another article. Static prices are a thing of the past. Most popular eCommerce stores use a dynamic pricing strategy that helps you change prices based on different parameters. You can use several aspects like the date of purchase, order quantity, product combinations, user roles, and more. Here is a popular option that you can try to set up a personalized, dynamic pricing on your store. This plugin helps you set up product prices dynamically after considering multiple aspects. You can create a personalized pricing plan for your loyal customers, by setting up discounts based on their email ID. When shoppers find that they get a personalized price on your store, chances are high that they will come back to your store. You can also set up this sort of price adjustments based on the purchase history of a specific customers. And, if you want to do this in a more elaborate fashion, you can create pricing tiers based on user role. You might need to use a user role editor plugin for this though. All your customers under one user role will see a particular price, while others see another price. This approach is more useful when you have wholesale shop. More WooCommerce wholesale tips here. If you want to explore more options for dynamic pricing, here is an article that will help. The visual appeal of your product page lies in your choice of images. How much focus you need to give in this department is purely based on the type of products that you sell. Your image strategy will be totally different than a designer outfit store, if you are selling digital downloads. In the former, lot of images with models might work, when appropriate screenshots would do the trick for the latter. So, you need to take a discretionary approach while adding images on your product pages. Let’s look at a few WooCommerce extensions that might help you with product images. Sometimes your customers would want every detail of the product in an image. Offering 360 degree rotatable image would satisfy a lot of your customers who prefer detailed visuals. This plugin will make your main product image rotatable. The 360 degree image will be responsive as well as touch enabled. It will also display navigation controls that will help your customers rotate the image the way they want. Providing an option to rotate your main product images can improve the customer experience on your store. A single site subscription of this plugin on the WooCommerce extensions store is priced at $49. You will get 5-site subscription at $99, and the 25-site subscription for $149. WooSlider comes with options to help you manage sliders on your site. You can extend the WooSlider plugin with the Products Slideshow extension to display your products in a slideshow. It gives you a lot of flexibility when you choose products that are part of your slideshow. You can choose featured products, or products from a particular category to be part of the slideshow. Sometimes, it might be more relevant, if you want to include only products that are in stock for the slideshow. You can display a set of featured images in a slideshow with the help of this plugin. A single site subscription of WooSlider would cost you $49, and the same for product slideshow would be $29. Sometimes adding a watermark to your product images are crucial. This will help create better brand perception among your customers and prospects. It can also help from other people using your images without permission, as you can add a copyright symbol and text. 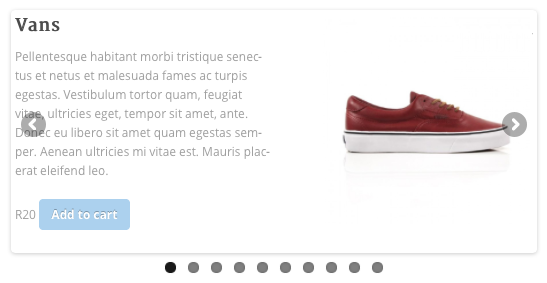 This WooCommerce plugin helps you add watermarks to your product images with great flexibility. In fact, it lets you create a different watermark for differently placed images. For example, one for the main image, one for the gallery thumbnails, another one when the image is zoomed in, etc. It is easy to set up, and you can add watermarks to your existing images as well. You need to shell out $49 to get a single site subscription of this plugin. 5-site and 25-site subscriptions are available at $79 and $149 respectively. Keeping a relevant title for your product is extremely important. A lot of times a descriptive title would be the way to go for customers and search engines to find your products. Some products can be identified simply by their names, while some might need a descriptive title based on its use. For example, if your site features dining tables a title like “Benchwright Extending Pedestal Dining Table, Rustic Mahogany” would be better of than simply saying ‘Benchwight Dining Table’. The title itself should be giving a clear idea to the customer regarding the nature and use of the product. One extreme of this approach can be seen if you search for HDMI cables on Amazon. The title of some products are almost like descriptions in themselves. You might not need to go to that extreme, however you can focus on the most important feature of your product and include it in the title. Product title itself has become a description in this case. You can probably focus on one or two important features to be included in the title. This is where you can include all the relevant keywords related to the product. However, you should pay due diligence in making sure that you are not resorting to keyword stuffing. Actually, that will negatively impact your search engine optimization efforts. Good copy writing is essential on your product page, which details the important features of your product without losing context. You can abundantly incorporate insights from your research for target audience here. Segregate and use specific words and terms that your target audience use to describe your product and their experience with it. You will find a useful SEO plugin here. This plugin allows your customers to post specific questions related to a product. If your product has complicated features this can be a really helpful tool for customers. It will give a considerable boost to your conversion rate, if you are promptly getting back to customers with answers. The single site license of the plugin is available for $49. This plugin will add a new tab on the product page, through which customers can post queries related to that product. You will find a few interesting tips to improve your conversion rate here. If your products have complicated operation procedures you need to provide good documentation options. This is particularly important if you are selling software or other digital products that need help setting up. Similarly certain products like bikes or furniture might need assembly instructions, and sometimes demonstration videos. And the below plugin will take care of this, beautifully. 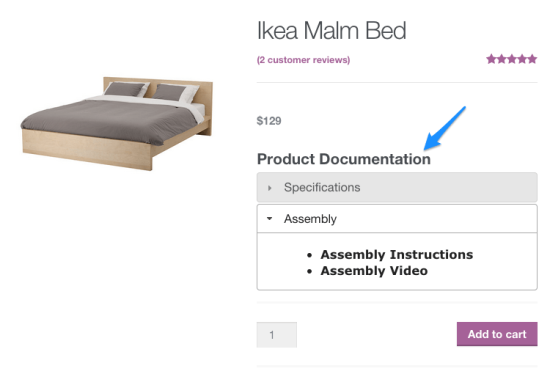 You can create a section on the product page for documentation. By default, this section will be under the product short description. However, using shortcodes, you can place it anywhere on the page. With the help of this plugin, you can upload any type of file that will help your users. If you prefer to display a link from another site, that is also possible; for example YouTube videos. Good documentation is an essential aspect of your product page, particularly if your product needs help in setting up. A good product page makes a lot of difference on an eCommerce store. First of all, it should have relevant information that will help prospective customers reach that page. Once they reach the page, there should be structured information detailing the key features of the product. In the product copy, you can give emphasis to user experience more than the technical features of the product. That way your customers will relate to the product better. We hope this article has provided you with some useful tips to enhance product information on WooCommerce. Leave a comment if you want to share an insight.